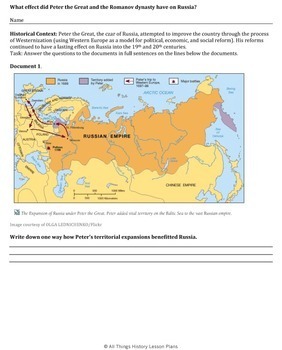 This Document Based Question (DBQ) was created for 10th Grade World History. It could also be used as a review for the New York State Global History and Geography Regents exam. 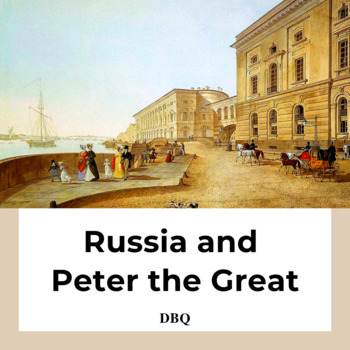 The topic is about Russia's Peter the Great, the Romanov Dynasty and the effects on the Russian Empire. It follows the format of the New York State social studies testing requirements for writing DBQs. The DBQ packet has 8 pages total, 5 pages are questions stemming from 8 primary or secondary source documents (one source is an image and one is a map) with constructed response questions. 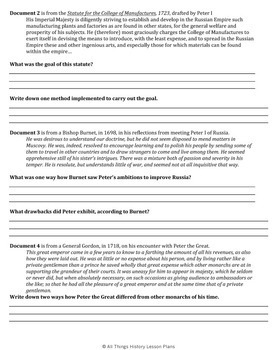 I created this DBQ for my Global History I course. 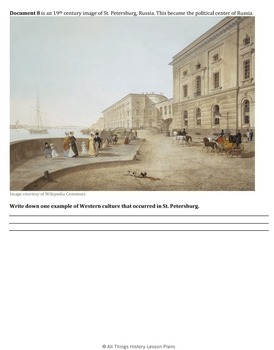 I knew this would be useful as it combined primary and secondary sources with analyses of maps and images. It does take considerable time to create these but I do know that they provide a strong outlet to apply the particular lesson involved. I hope you find them useful as well! Please leave feedback on your students’ ability to complete the tasks involved in this DBQ. I’ve left the DBQ as a Word Document so that you can add more space for writing answers as needed. If you want this DBQ, you can make it as part of my Build a Bundle - 3 DBQs for $9. Spend just $5.00 more and get 2 more DBQs! This DBQ addresses the Common Core State Standards. It has been updated with a page outlining the English Language Arts/History/Social Studies grades 9-10 as outlined at http://www.corestandards.org/ELA-Literacy/RH/9-10 and http://www.corestandards.org/ELA-Literacy/RH/11-12. This product is the work of All Things History Lesson Plans. It is intended to support the implementation of the CCSS. No approval by, nor association with, the creators of the CCSS is intended or implied. All the images I've used in this DBQ are in the public domain. Stay in touch and follow me on Facebook and Pinterest.